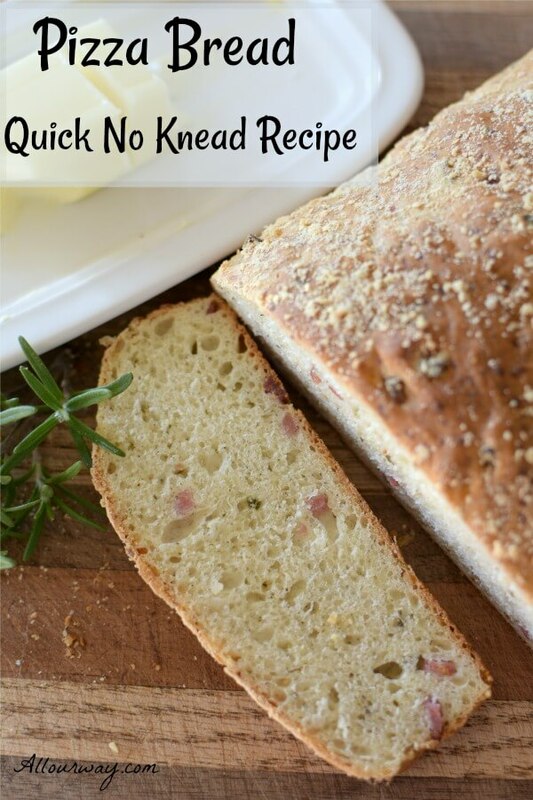 Parmesan Herb Pizza Bread is a quick no knead recipe that fills the home with the rich fragrance of Italian herbs, cheese, and salami. There is nothing like the aroma of hot homemade herb loaves baking in the oven. The herbs and cheese bring a bold flavor and scent to the bread reminding you of your favorite pizza restaurant. It’s an easy yeast bread that takes little preparation and effort. Most of the prep time is spent in letting it rise and bake. You’ll find this no-knead recipe so easy, you’ll want to bake it often. Promise! This recipe has been updated from the original April 2014 version in order to provide a better experience for our readers. Last update January 2019. For this recipe you will need all-purpose flour, instant yeast, sea salt, butter, warm water, Parmesan Cheese, Italian seasoning, sugar. Do you remember the lean years? The years where every penny counted and you had to be very creative in everything you did? Those were the years where there was nothing left in the budget for gifts or presents. It was because of necessity that we had to get creative with a birthday gift for my father-in-law. The solution came to us out of the blue and it seemed obvious. I loved to bake; Hank, my father-in-law, loved to eat bread. But, one loaf of bread seemed a little miserly. So, we bought him a very nice birthday card and in the card I wrote and promised I would bake him a loaf of bread every week for a year. You’d have thought we’d given him the world. Pizza Bread is fantastic with butter or dipped in olive oil. This is a very easy yeast bread recipe to make at home and the reasons I picked it as the first one to to give as a gift was . . .
No need for fancy equipment. A batter bread which meant no knead. A quick yeast bread that didn’t take a lot of preparation. Herbs and cheese would give the bread lots of flavor. Everything goes into a mixing bowl. How easy is that? Pour warm water in a mixing bowl. Sprinkle the yeast over the warm water. Add the dry ingredients to the yeast water. Put dough in greased bowl and leave until doubled. TIP: I use a shower cap to cover my dough container. We get them when we travel. They’re cheap and reusable. 5. Bake Bread 6. Let Cool 7. Slice Bread 8. Enjoy! Stir down batter with wooden spoon. Place dough in your baking container (either a 2 quart casserole or 2 loaf pans). Sprinkle the top with parmesan cheese. Immediately pop into 375° F. oven. Bake for 55 minutes until nicely browned. Turn out on wire rack. Cool. Enjoy!! 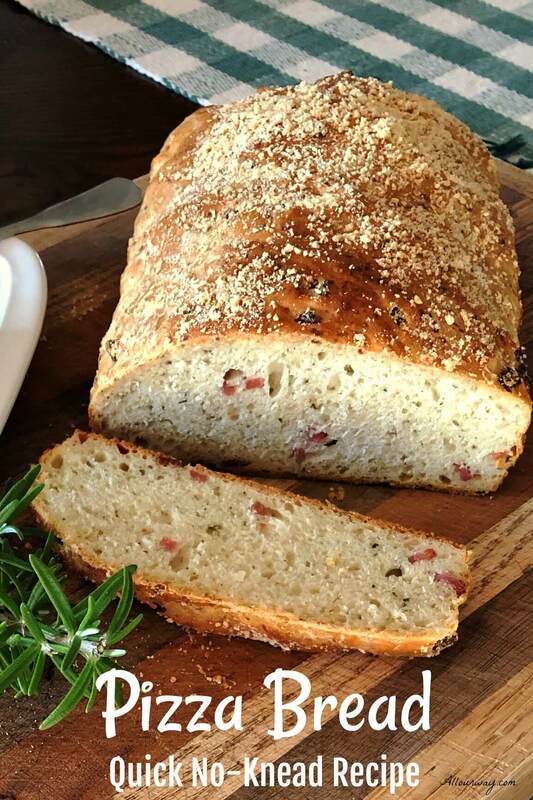 The beauty of herbs is that you can adapt almost any bread recipe into a super delicious custom bread just by adding some of your favorite herbs. Not only do herbs taste good, they are good for you. Choose just one herb or a blend of complementary herbs. Add cheese to the bread to further the flavor of your bread. Tuscan Herbs – Rosemary, Basil, Thyme, Oregano – Pair with garlic and parmesan. Provincial Herbs – Tarragon, Savory, Fennel, Basil, Thyme, Rosemary – Pair with gruyere or for a big flavor punch blue cheese. Mediterranean Herbs – Oregano, Marjoram, Dill, Mint – – Pair with lemon, peppers, feta. Fines Herbs – Chervil, Parsley, Chives, Tarragon — Pair with gruyere and black pepper. Condiments/Spices – Sun-dried tomatoes, dried onion flakes, lemon zest, olives, pepper flakes, roasted garlic. Seeds and grains – Sunflower seeds, pumpkin seeds, walnuts or your favorite, oats, flax, wheat germs, chia seeds, poppy seeds. Meat – bacon, salami, pepperoni, prosciutto. This bread was so popular with my Father-in-Law that every year he insisted on the same birthday gift, a bread a week, with Herb Parmesan Pizza Bread being a monthly regular. We hope you’ll try out this recipe — you don’t need a huge mixer. When I first made this bread I just had a hand mixer. For the final addition of flour, I just mixed it with a wooden spoon. We guarantee your family will love the Pizza Bread and it was Honey who suggested adding the salami to the dough. He was right!! It tastes fantastic. Tutti a tavola è pronto! Un caro saluto e alla prossima. These breads are easy to make and freeze beautifully. Thank you for being a part of All Our Way! We like using instant yeast because we don’t have to let it proof like active dry yeast. We’ve found that we can always rely on the Saf-Instant brand. 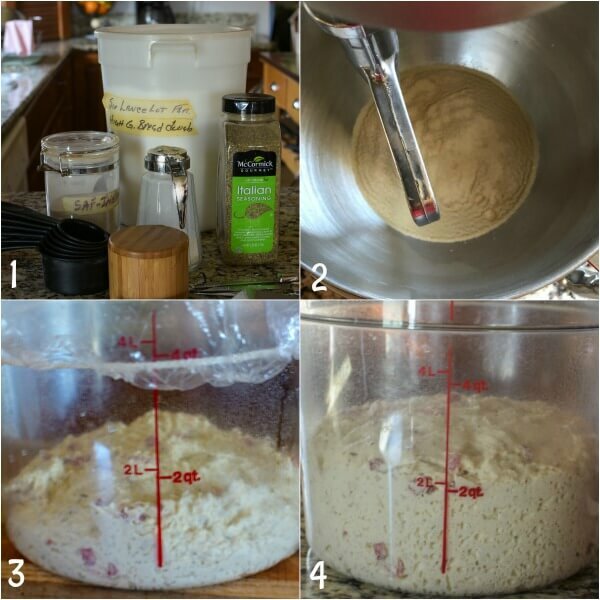 This is an easy bread to work with, the dough is more the consistency of a batter bread. Most of the prep time is spent letting the herb bread rise and bake. The original recipe did not have any meat in it but Hubby got the brilliant idea to add salami to it. I didn’t think you could improve on the original recipe but it took the recipe up another notch. The Pizza Bread would be wonderful served with an Italian meal, sliced for sandwiches, or just slathered with butter. If you like this recipe please consider giving it a 5-star rating. 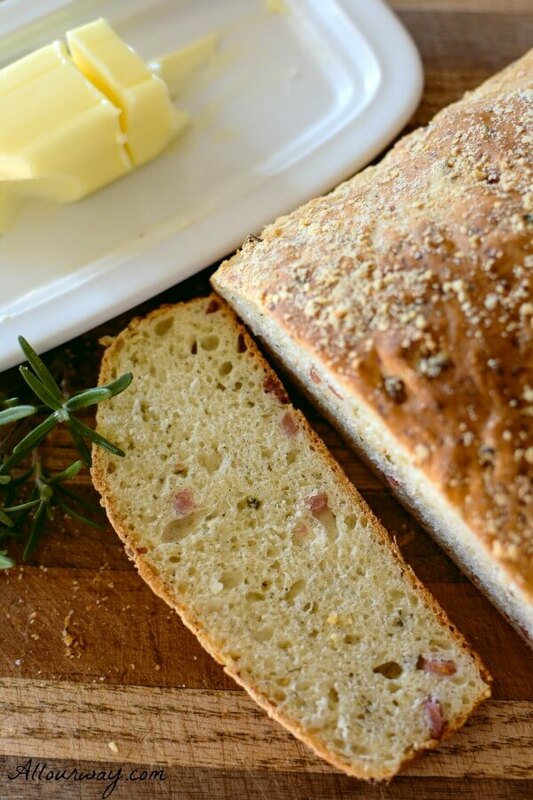 A quick and easy bread with the taste of Italy. The herbs and Parmesan cheese fills the house with an aroma of pizza baking. Sprinkle yeast over warm water in large mixing bowl. Let stand a few minutes: stir to dissolve. If you are using instant yeast skip this step and just put the warm water in the mixing bowl. Add sugar, salt, butter, 1/2 cup cheese, your choice of seasoning, 3 cups flour ( and instant yeast if you didn't use active dry). Beat, at low speed, until blended. At medium speed, beat until smooth -- 2 minutes. Gradually add in the rest of the flour. Scrape down bowl and beaters. Put dough into greased bowl. Cover with plastic wrap. Let rise in warm place (85F), free from drafts, about 45 minutes, or until quite light and bubbly and more than double in bulk. Preheat the oven to 375F. Lightly spray a 2-quart casserole with nonstick oil; set aside. With wooden spoon, stir down batter. Beat vigorously 1/2 minute, or about 25 strokes. Turn into casserole. Sprinkle top of batter evenly with 1 tablespoon grated Parmesan cheese. Bake 55 minutes, or until nicely browned. Turn out onto wire rack. Let cool, or serve slightly warm, in wedges. I package active dry yeast is equal to 2 1/4 teaspoons. You may need to tent the bread with aluminum foil if the top is browning too quickly. Note: Recipes and content from © 2014-2019 All Our Way are copyright protected. Please do not use content or recipe without prior written permission. If you want to share the information please link to this post. Grazie. This bread sounds so delicious and I can think of million things it would go perfect with. I really loved your little birthday present story btw. Really amazing. My poor fiance is always trying to make bread, but he always over-kneads it. Wait until I tell him this doesn’t need any at all! I don’t make bread very often and this reminds me I need to give it a try again soon! This sounds wonderful!! I was just talking to my husband that I need to learn how to make breads) Love your recipe and going to try it next week! You certainly know how to win over a man’s heart. There is no telling how many slices my husband could eat. Ahhh parmesan herb bread! Perfect with soup, pasta, snack, anything! You’ve made it sound so simple which is fantastic. Thanks for sharing! No knead bread with herbs and cheese sounds perfect. I’m no baker but this sounds too delicious to pass up! Baking a loaf of bread every week for a year is a fantastic birthday gift–lean years or no. The bits of pepperoni scattered throughout the bread really carries the flavor through the entire loaf. Good call! This bread must be so flavorful, with the herbs, Parmesan and salami. It sure tastes like pizza! Plus, it’s no-knead! I make a no-knead bread but simple, no flavoring. Will try that! Ooooh can I eat this entire loaf please? 🙂 I can’t believe I’ve never tried this before! I adore all things pizza and honestly, this looks easier to make than pizza from scratch. Game-changer. Oh, my gosh! This bread sounds delightful! I love that you added salami! I also love that it is doesn’t require kneading. Not that I don’t knead some bread but if I can get away with not having to knead then I’m all for it! 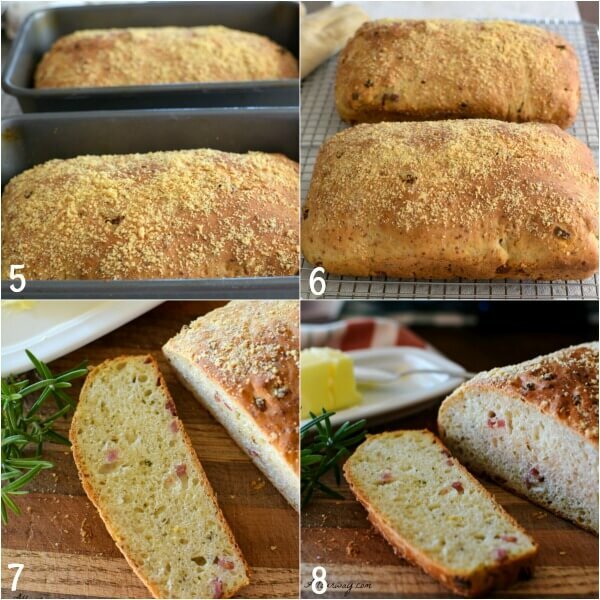 My hubby will go ga-ga over your pizza bread and I can’t wait to make it. What an interesting recipe! Salami in bread? And a no knead? I am very intrigued to try it out, it looks so incredibly tasty! This is such a brilliant idea – homemade bread but with all the flavours of pizza in it. I’d love it with some homemade tomato soup! I love the salami in this pizza bread! It really drives home that pizza flavoring and provides such a fun additional texture. Plus, the no-knead aspect of this bread makes it so easy to keep in rotation. I don’t have to worry about watching it too closely. This is truly a bread that the whole family loves! I have seen this come across my feed so many times. I really need to give this a try. With all the homemade soups I have been making, this would be the PERFECT dunker for sure. I can smell it baking now!! What a great recipe. I love how simple it is, and how versatile. I can think of so many great occasions to make this for. Definitely adding it to the menu for superbowl this year. Thanks. Great recipe, with wonderful details for getting everything right – and the crumb on that bread looks spectacular, especially for a no-knead bread. I’m always looking for a good new bread recipe to add to the repertoire, and I know this would be a hit with my family. Cheers! Well I do love it that we can make bread and not have knead it. How much easier can it get? I love the Italian spin you put on this recipe with the herbs and parmesan cheese. Totally a winner in my book. Thanks for the recipe! What an excellent gift! I’m not surprised your fil was all over it. And I love no-knead breads – it’s really amazing what yeast will do if you give it a little time and space. As for those pizza flavors, wow! I can’t wait to try this. This bread looks absolutely amazing. I would eat it whole. Love how you turned this simple bread into real treat by adding pizza flavors. I must give this a try. My hubby will love it I know! Oh my gosh I LOVE no knead breads – they’re my kind of baking! But I haven’t gotten this adventurous with flavors, yet! How fun!! 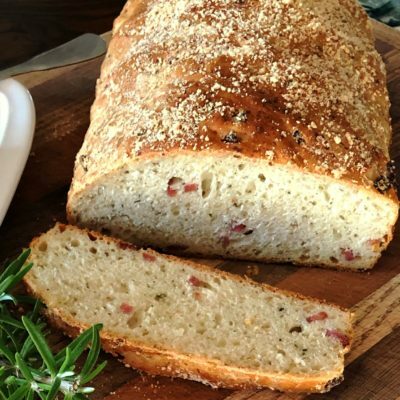 My family will LOVE this – my only concern is how quickly I will eat it – I have a problem when it comes to homemade, fresh baked, flavorful breads like this! Marissa, I you Know I love homemade bread, This Parmesan rosemary bread looks delicious perfect with a bowl of soup. This recipe is so perfect. Nothing beats the smell of freshly baked bread! I’m intrigued by this pizza bread. It looks absolutely amazing. I love the story behind the bread. How thoughtful of you! I’ve never made pizza bread before, but this recipe looks so good! I’m going to eat it ALL! 🙂 And I love that this is no-knead, too. Can’t wait to try this out! Hi Marisa, Good minds must think alike….I have ingredients on my grocery list for making bread this week…….Your recipe sounds sooooo good……better than the recipe I have……Give me a loaf of bread and stick of creamery butter…….OH MY😋. I’m a happy camper. I can’t wait to try this recipe. Love making no-knead breads. This recipe looks delicious. I have a question. Can I add minced garlic to this? Hi, Toni! Yes, you can. Let me know how it turns out. Love experimenting with ingredients!! What a thoughtful and delicious gift you gave him. I can’t think of anything better than the gift of time for someone who is aging and has everything. This would be delicious with a bowl of soup – or a glass of wine. Wow! Pizza bread. I’ve never thought of doing this. I’ve been meaning to step outside of my usual classic crusty bread, but my mind never went to pizza. (Which is shocking; I love pizza. I never get tired of pizza.) The flavors in this recipe are so bold in all the right ways. I love the idea of pizza flavored bread. The other combinations sound tasty as well. The Provencal blend sounds particularly good to me as I love both blue cheese and gruyere. I LOVE BREAD!! In fact, if I was stranded on an island…I would want BREAD, WINE and CHEESE!! I could make a meal out of bread, especially one that sounds as delicious as this. I can think of nothing better in life than the aroma of bread baking. I even love the aroma of bread proofing! Don’t you think that is weird?? I love making homemade bread. Once you get used to eating homemade bakery bread is never the same again. I love how simple and easy this recipe is. 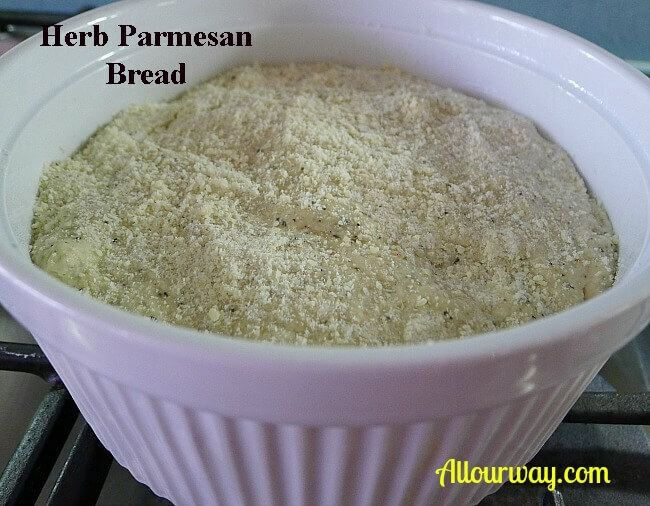 Parmesan is always a great addition in bread. I can’t wait to try this one Marisa. I’d love to receive a gift like that 🙂 And this looks delicious! I love making bread but don’t really enjoy kneading so this is great. And thanks for the shower cap tip. Genius!! I love pizza! What a wonderful idea to make the bread with the pizza flavor! This is such a lovely bread and I bet amazing along side a lasagna or pasta dish. I know my boys would love to dunk warm slices into their sauce. Whoever invented no knead breads is a genius! I am not much of a baker but have always wanted to be able to make 1 good loaf of bread and I feel like I can do that with no knead bread. However this version looks fabulous! My son would just go nuts for it and I’m going to try to surprise him next week and make it. Wish me luck! I am going to have to try pizza bread on my kids, cause they love pizza so much. Thanks for sharing. Marisa, I love no-knead breads. I have never made a pizza bread. It sounds amazing! Well homemade bread is the BEST. I so remember my baba making bread all the time. I would run over to her house after school. I was hoping the bread would still be warm….so I could cover a slice in butter. The best after-school snack ever. I know my family would devour this in no time flat. I can just imagine the aroma as this bakes too. Ok…so I have NEVER met a bread I did not love. This sounds amazing. I can just imagine the aroma as this bakes. This would be so good with eggs, in a sandwich…or just dipping in oil. I would be happy eating it covered in butter too. FOR THIS KINDA RECIPE…I MADE IT ONCE 30 YRS AGO …THEN GOD SENT YOU WITH WHAT LOOKS VERY VERY CLOSE ….MY ONLY QUESTION I HAVE BEFORE I GET STARTED IS THE SUGAR….WILL THAT MUCH SUGAR …MAKE THE BREAD SWEET ?…THANK YOU …GOD BLESS …AND BY THE WAY WHEN I MAKE BREAD …. The bread is definitely not sweet. If you have any other questions please feel free to write and next week we’ll be doing a tutorial on bagels.